In my previous blog, you have already get the idea of how to use a simple FUIFormCell control.But it will not match your real requirement of just using one control. In this blog, I will guide you to build a complex input screen. In the screen, we used 5 different kinds of controls for six input fields. As below table. For the usage of every control, please refer to the document or Fiori Mentor app in iPad. Now we start to build the project. Here are some key steps for prepare project for this blog, if you are not familiar with that, you can refer to my previous blog. 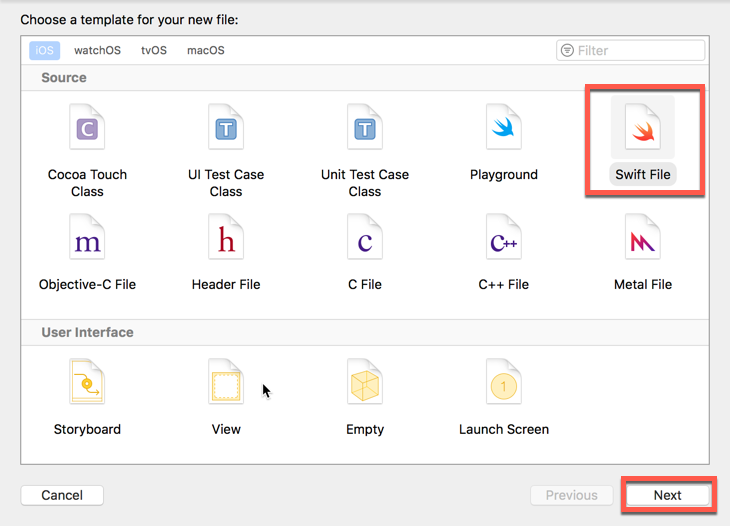 Mention that the code do not contain the project file of Xcode, it only contains source code. Because the Fiori for iOS library is two large to share. 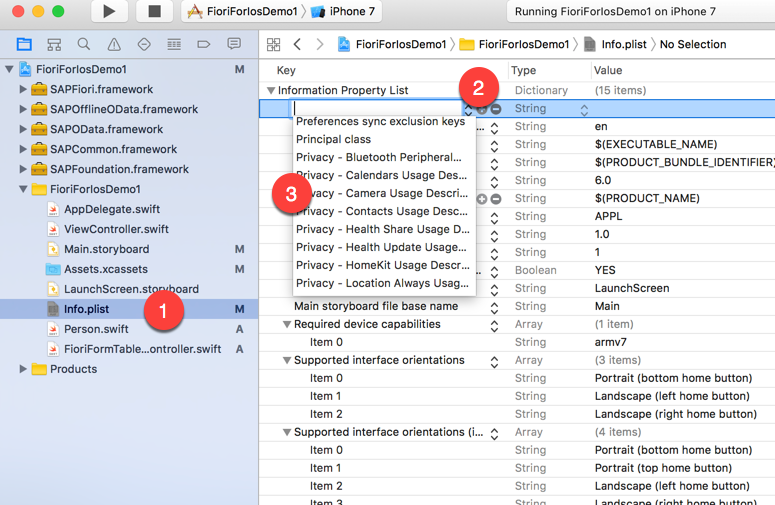 For the code to run, you need to create a Xcode project manually and embed all Fiori libraries into the project, and copy my code into your project. Before we build the UI, we need to create some variables to store our data. For we have 6 variables, we create a structure to store structured data. 1.Create a Person.swift and create structure with 6 properties for it. 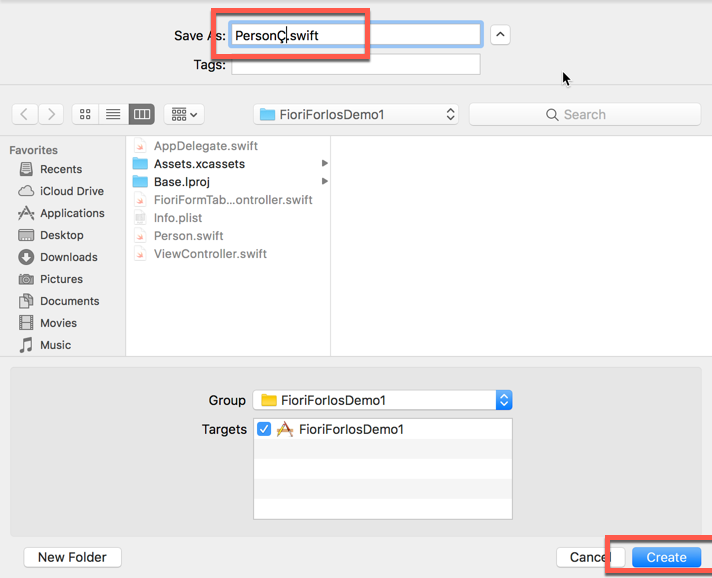 Save as Person.swift for this file. 2.Create array for providing value list for title and gender. Now we create two arrays to provide input help for title and gender fields. We create it as static property of Person structure for convince access. Now we’ve finished the model. And we need to create an instance and fill the structure with sample data in our view controller. 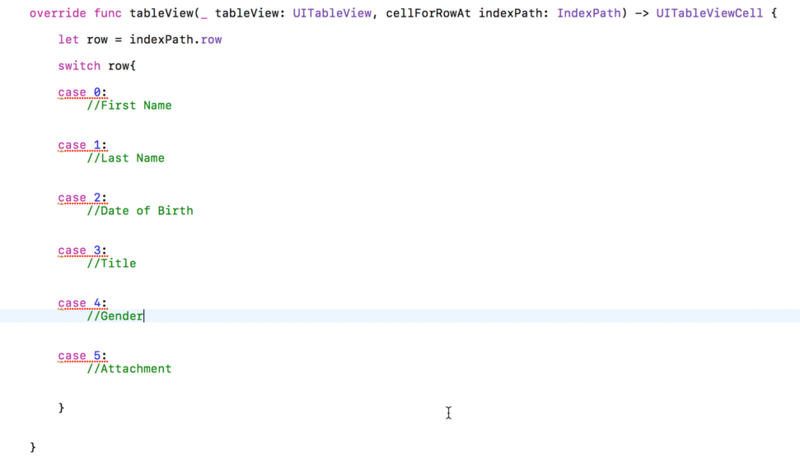 Open FioriFormTableViewController.swift, create a property named person with initial values. In FioriFormTableViewController, modify the method ViewDidLoad, register all controls you need. Mention that whatever how many times you use a control, you only need register once for each control. So we only need to register 5 times, not 6 , in our case. For this example, you should determine how to return your call according to the position, which is get from parameter indexPath. So first to get the row number and write a switch-case statement to write all the branches you need and write some comments to indicate which cell you want to fill in. In case 0 branch, dequeue your cell as FUISimplePropertyFormCell, set up properties as previous exercise and return it. In case 1 branch, setup cell as step 4. 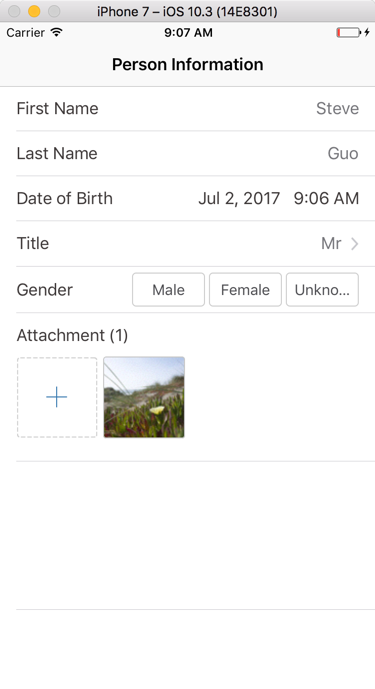 If you have experience of iOS programming, you may remember the complex for creating a simple date input field. For the title field, we want user to select from a list. After user click on the field, we need a separate screen to display the input help. And the navigation to help user navigation to and back from the input help view. Fortunately SAP helps you to handle all those things. You can do this by using FUIListPickerFormCell control by simply provide a value to hold user selection and a value list for input help. The result of this control is an array because it is designed to deals with multiply selection , so we need to do the conversion. We use FUISegmentedControlFormCell for gender selection. Although the appearance is different with previous one, the code is similar. This control only allowed for single selection, so we do not need to handle the conversion from array to integer. Here is a good point to test your application for a while. Setup cell for attachment is quite complex because the attachment control involves call back function and needs to access camera and filesystem of the iPhone. 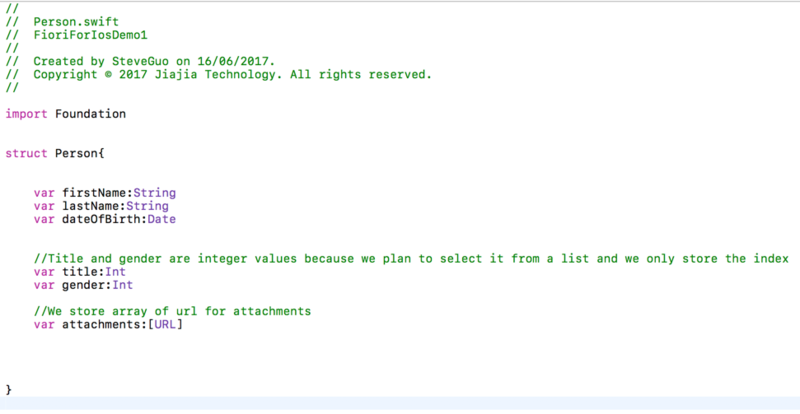 The use of Fiori attachment control is quite similar with standard attachment control as described in the document. For now you can follow my instruction. Using FUIAttachmentFormCell control, you can handle the creation, manage and delete of attachments. 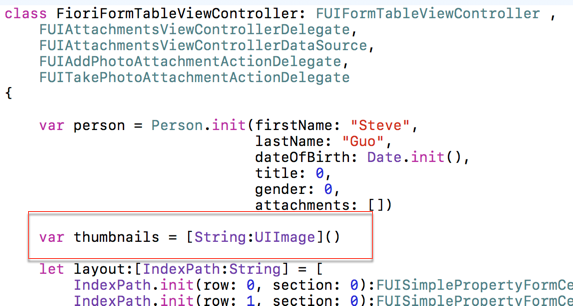 To handle those actions, you need to implement the delegate FUIAttachmentsViewControllerDelegate and FUIAttachmentsViewControllerDataSource. You control how to add attachments by adding actions to the control. In this example we use FUIAddPhotoAttachmentAction for choosing photo from photo library and FUITakePhotoAttachmentAction for taking photo using camera. After you take photo or add photo file, you need to save the url of photo and generate a snapshot for the display in the attachment control, this example also involve some code for process photo. But this is not the point of this blog and for all controls you can copy sample code from SDK Documentation and Fiori Mentor App. The first function define the behavior when user delete attachments. The parameter contains the index user chose to delete. In the function, we delete data from person.attachments and reload data to refresh the control. The second function define the behavior of failure render of attachment item, we do nothing for this. Note: You can find functions a delegate(protocol requires) and it’s sample code by right click the protocol name and choose Jump to Definition. It looks like this function returns two value this is the concept of tuple, combine several variable into one in a semicolon. Now you have finished the coding part, it’s only one step to finish your project. Now you’ve done! Run your app to see the result! Congratulations! Although we have built a so complex screen by using simple code( comparing t to pa original cocoa touch framework), the code is not reusable and not easy to maintain. In my next blog, I try to make this example with reusable code, make it a pattern for similar case. Hi Steve, currently I am facing the issue in FUIDatePickerFormCell. When I click on it nothing happens. Could it be a problem with SDK? I have never meet the situation exactly as you’ve mentioned. But I really had some troubles that controls did not behave as expected. 1.Try to update your SDK to the newest version. 2.Keep your TableViewController clean in the GUI of storyboard. 3.Be sure that your FUI control is bounded to some variable, with correct data type, even if it is nil. 5.Some times it’s just the problem of simulator, try it on your real device. Mahesh I had a similar issue recently, the cause of it was due to calling the ‘didSelectRowAt’ method in my tableViewController. For some reason, if you override this method it interrupts the UIDatePicker call from the Fiori SDK.